Do you think of cranberries when you think of fall or Thanksgiving? 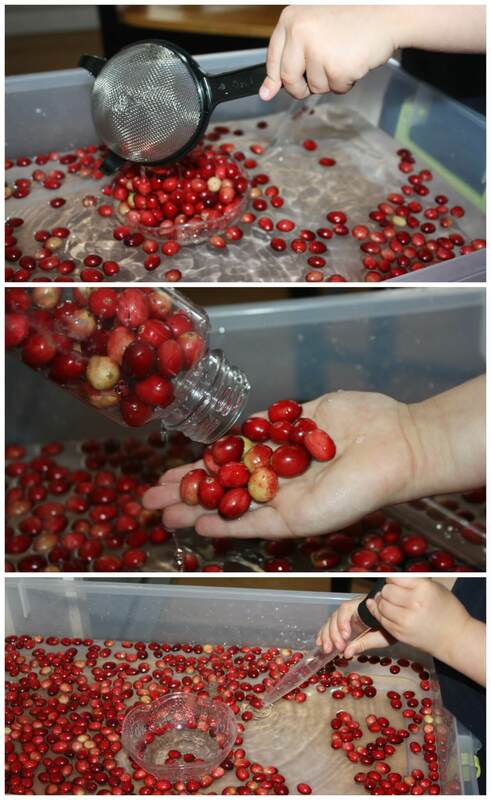 This cranberry science activity is an easy and awesome sensory play idea to add to your Thanksgiving line up! Simple set up, simple invitation to play, and an easy science lesson all in one activity! We love easy science play and have tons to of science and STEM ideas to share that are perfect for kids. Of course, cranberries are perfect for Thanksgiving science too. We love pairing science and sensory play for hands on learning. Science activities you can really dig your hands into are perfect for our youngest scientists. Turning simple science into sensory bins is a great way to explore how things work too. 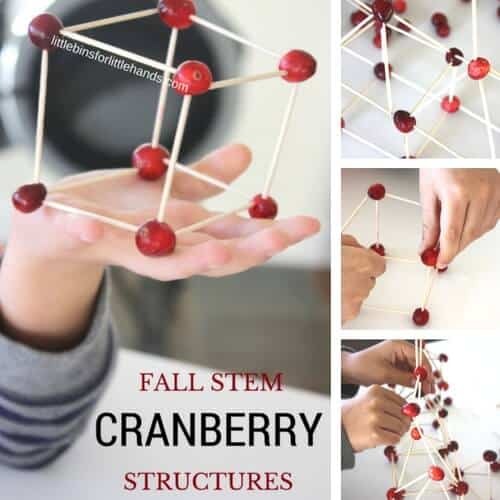 You can also build Cranberry Structures for STEM and fine motor play or check out a taste safe cranberry slime included here. One bag of cranberries can provide so much fun for kids. Scientists must practice their fine motor skills! Many science tools require fine motor movements, patience, hand eye coordination, and dexterity. We love using fine motor science activities to strengthen our hands in a really fun way! Not to mention that my son has developed a great pencil grip from all of these non-writing activities! A true hands on learning experience that builds on valuable skills for young kids. Science is awesome and really perfect for those curious kids. Plus simple science activities will encourage curiosity in the world and how things work. Fun science activities help young kids to develop observation skills, critical thinking skills, and experimenting skills! We started off with some simple cranberry science activities including irreversible change. We have been talking about that for a few weeks now as well as reversible change and transformation. We baked a pumpkin to check out irreversible change too! We had a little fun with gumdrop science and STEM as well. Or you can check out our chocolate science for some yummy reversible change! You will need a bag of fresh cranberries from the produce section of your grocery store. Also, you will want to set out a bin of water to create a water sensory play activity along with our cranberry science activity. Prep your tools, and you are ready. Our fine motor tools included a baster, salad tongs and various other tongs, a scoop, and sifter. Take a look in your kitchen drawers for simple fine motor tools. Eye droppers and basters are our favorite and are great for strengthening little hands. First we tested the fresh cranberries to see if we could smash them as is. Before you try this, make sure to ask your kids what they think will happen. Encourage developing their “think like a scientist” skills by making predictions and coming up with a hypothesis. Read more on the science method here. Well, we couldn’t smash them, so what else could we do to soften them. Come up with some ideas to test. Next we boiled them for a few minutes and then tested again. Can you squash them now. We could! Then make sure to make some observations by comparing and contrasting the fresh and cooked cranberries. Remember, these cranberry science activities are great for developing observational skills so ask plenty of questions! What do you see? What do you feel? What do you smell? What are the differences? MORE CRANBERRY SCIENCE TO TRY! Sink or float? This cranberry science activity makes great water sensory play. 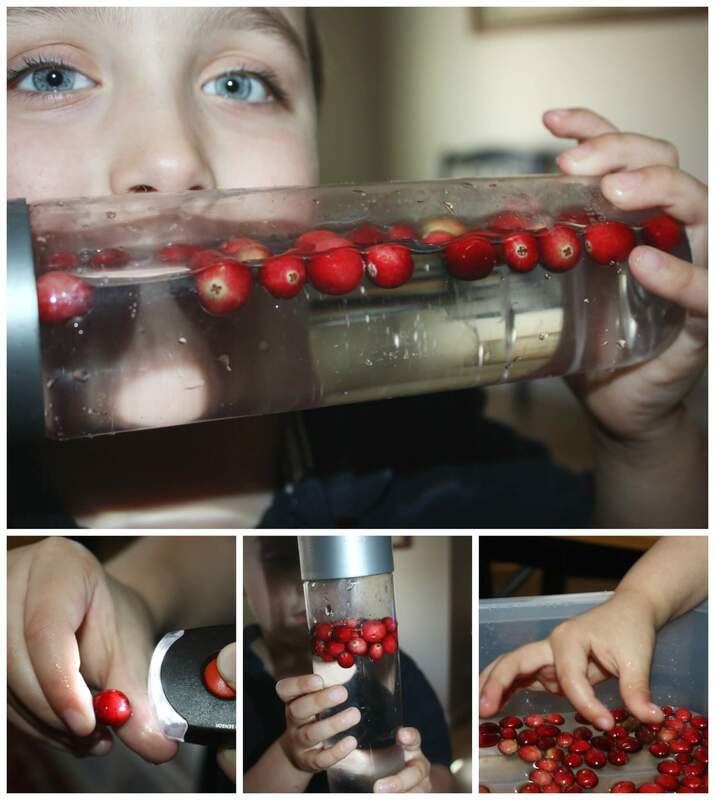 Have your kids help you add cranberries to the water. Again make sure to have them make predictions about whether the berries will sink or float! Add your fine motor tools to the water sensory bin for great play. You can easily increase fine motor skills through play! We used a water bottle to make a simple sensory bottle. Sensory bins are great fun for adding fine motor tools. Look at all the great fun and learning you can do with a bag of cranberries. Try a recipe on the bag while you are at it! 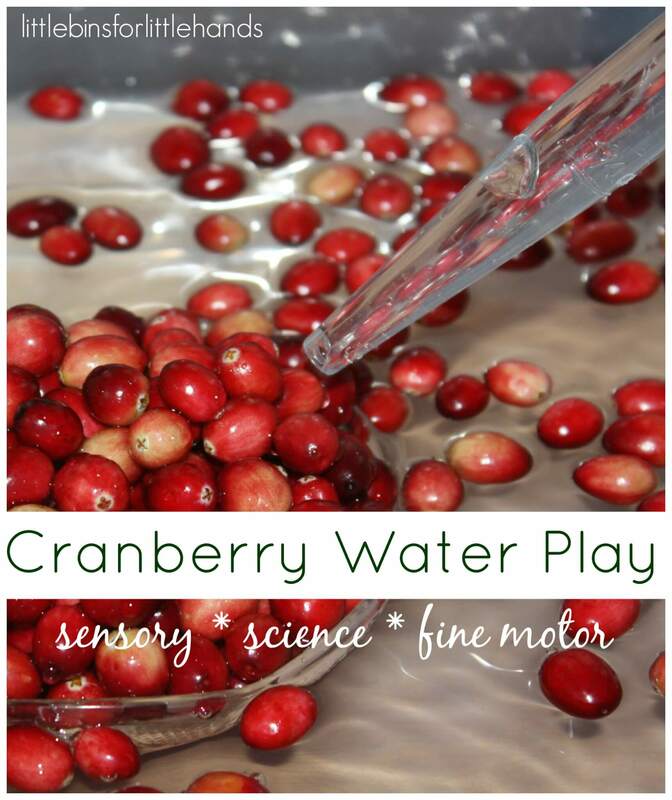 EASY CRANBERRY SCIENCE AND SENSORY PLAY FOR KIDS! 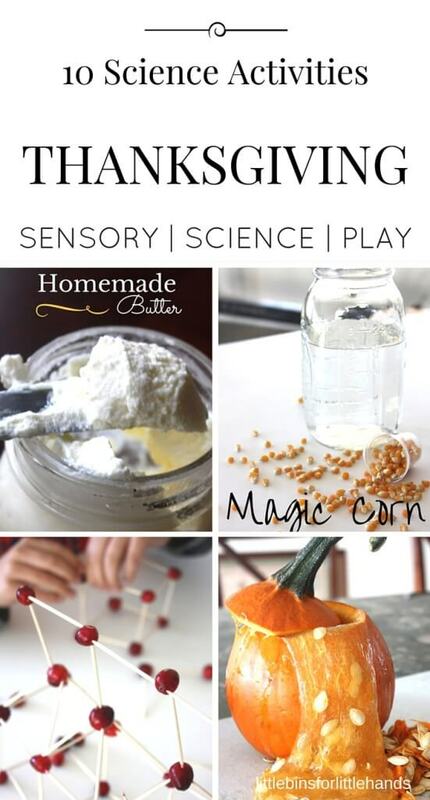 Click on the photos for more great ideas for Thanksgiving Science and Play. Hmm Maybe they weren’t fresh enough? We have had ours going for a few days now and they are fine. I left the bag in the fridge before we used them.